To play, return a character you control to its owner’s hand. Search your deck for a card with the same name as that character, reveal it, and put it into your hand. If you’re playing clone saga or a legend-style deck, sacrifice your weakest drop of a character, pop with with Origin Story, now have your NEXT drop but you also have a power-up. On defense, if you stand to take a game-ending attack on you, origin story and tell them to try again minus their for that attack modifiers. You have to have a character in play with the same name as a bigger drop in your deck. If target attacker has the same cost as a defender, this attacker gets +3 / +3 this attack. you’re dealing with a team of beat-sticks (think Future-foes anyone..) its only true drawback, is that it can’t protect you from nasty surprise…. 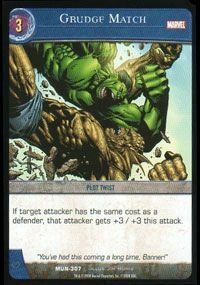 Another Installment of the spot light on cards that has impacted the game, this time its a team-up. Ongoing: At the start of the combat phase, choose an affiliation among characters you control. Crossover all affiliations chosen this way. In any team-up deck, unless its with dual affilated characters of simular teams (JLA/JLI), you usually have more of one affilation than another, and once you get the other it’s usually a little too late. But now, you have a way to bring two or more teams together, and it still keeps going. Its a few team-ups in Vs that has made a big impact, starting with Millennium from the Green Lantern [team up + Draw a card], Heroes for Hire [pay 1 to pass on 1 affilation] training day [team up once per turn] But Here Comes Tomorrow gets my vote for a notch above the rest because it stacks each turn, and it starts at the 2 cost. One random thing about Vs, there are some cards that should be rare, but isn’t. Plus there are rares that should be common/uncommon. Today’s focus, is not only a card that should be rare, and also changes the game in so many ways. Mystique has all character names while in your deck, hand, or ko’d pile. Also, she’s a 1 drop 1/2 Range. Now, she has all names, which means she has so many cards to combo off of, and she also makes more cards playable. Not since Harley Quinn, Dr. Harleen Quinzel, or Layla Miller – Butterfly has we have a NON-Banned, Janky 1 drop with multiple uses. By herself, she can power-up any other character, which is powerful in any format. For starters, Hero’s of Two worlds (To play, discard a character card. Search your deck for three affiliated character cards with the same name. Reveal them, remove two from the game, and put the rest into your hand.) Adding her to the mix of things makes this card so much better. You can discard her for the drop you want, or go get the drop you want, and two Mystique’s and throw them away for the card you want. (This also eliminates you drawing her on a later drop when you might need something a little bit better or more powerful. Another use is Assorted Aliases (To play, discard a character card. Target character gets +3/+3 this attack if it’s a different version of the discarded card.) Which means discard her to get a +3/+3, which is good defense. Fight or Die! ( Target warbound attacker gets +3 atk this attack. Anger & Hate (To play, remove a secret society character card in your ko’d pile from the game. Now, for some character abuse!!! These are a few of her many modern uses/abuses, but either in draft or a sealed deck, having her in your deck has no real downside. One of the bigger Jaw droppers of MEV is Cutting Loose. Each of up to two target characters gets +2 atk while attacking this turn. Pros: It boosts 2 characters for the price of one, which can make up for a sloppy formation, or if you are dealing with characters that can make a attack not legal, (Save Flying High, think characters with evasion) you won’t waste attack pumps, plus it makes 2 characters attackable, if they have average or above average stats. Cons: When compared to the other “while attacking cards” they bring something else to the table. You get +2 Atk for 2 characters, but no flight or range. I know, people will say that’s asking too much, and it really is, but that is still the only downside to the card.